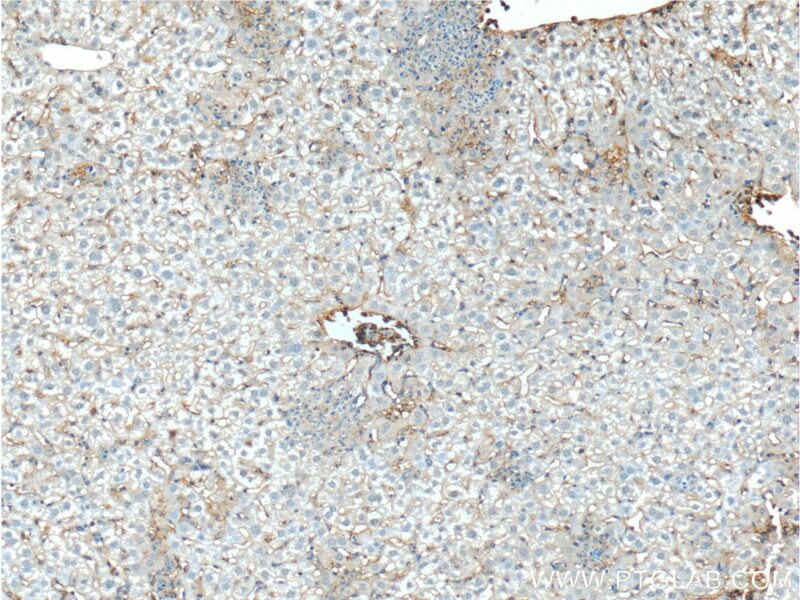 Immunohistochemical analysis of paraffin-embedded mouse liver tissue slide using 10020-1-AP (Icam-1 antibody) at dilution of 1:200 (under 10x lens). 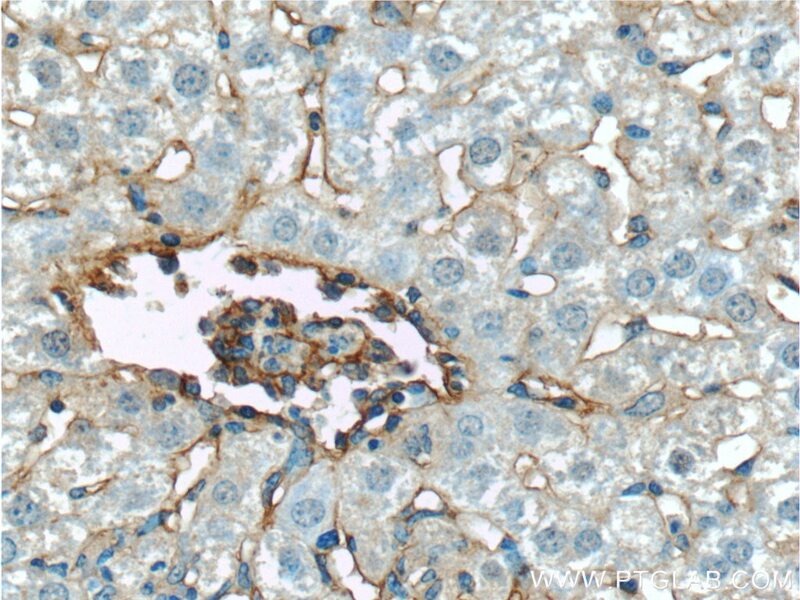 Immunohistochemical analysis of paraffin-embedded mouse liver tissue slide using 10020-1-AP (Icam-1 antibody) at dilution of 1:200 (under 40x lens). Intercellular Adhesion Molecule 1 (ICAM-1), also known as Cluster of Differentiation 54 (CD54) is a transmembrane glycoprotein constitutively expressed at low levels in endothelial cells, pericytes and on some lymphocytes and monocytes1. It is located at the cytoplasmic membrane, with a large extracellular region of mainly hydrophobic amino acids joined to a small transmembrane region and a cytoplasmic tail. It has a molecular weight of 75 to 115 kDa depending on the level of glycosylation. What is the function of ICAM-1? ICAM-1 is important in both innate and adaptive immune responses as an adhesion molecule. Although it is constitutively expressed, in the presence of pro-inflammatory cytokines such as TNFα the endothelial cells are activated and upregulate expression of ICAM-12. In blood vessels lined with endothelial cells, leukocytes that are rolling over the surface are able to bind to ICAM-1 and transmigrate through the endothelial barrier and into the tissue. The initial binding of the leukocytes to ICAM-1 causes a Ca2+ release that initiates endothelial cell contraction and weakening of the intercellular tight junctions3, 4. This protein can be used as an indicator of endothelial activation and of vascular inflammation. What is the role of ICAM-1 in disease? Beyond the role in the immune response, ICAM-1 has also been identified as the target of attachment for the human rhinovirus, the cause of the common cold. Binding of the virus to ICAM-1 causes the viral capsid to uncoat and leads to release of the genetic material5. Hubbard, A. K. & Rothlein, R. Intercellular adhesion molecule-1 (ICAM-1) expression and cell signaling cascades. Free Radic. Biol. Med. 28, 1379–86 (2000). Long, E. O. ICAM-1: getting a grip on leukocyte adhesion. J. Immunol. 186, 5021–3 (2011). Lawson, C. & Wolf, S. ICAM-1 signaling in endothelial cells. (2009). Lyck, R. & Enzmann, G. The physiological roles of ICAM-1 and ICAM-2 in neutrophil migration into tissues. Curr. Opin. Hematol. 22, 53–59 (2015). Xing, L., Casasnovas, J. M. & Cheng, R. H. Structural analysis of human rhinovirus complexed with ICAM-1 reveals the dynamics of receptor-mediated virus uncoating. J. Virol. 77, 6101–7 (2003). Tumor-derived intercellular adhesion molecule-1 mediates tumor-associated leukocyte infiltration in orthotopic pancreatic xenografts. Cyclosporin A and phenytoin modulate inflammatory responses. Effects of pegylated interferon α2b on metastasis of hepatocellular carcinoma. Bone marrow cells: Important role on neovascularization of hepatocellular carcinoma. Endothelial precursor cells promote angiogenesis in hepatocellular carcinoma. Toll-like receptor 4 signaling by follicular dendritic cells is pivotal for germinal center onset and affinity maturation.